July 14, 1099. The city of Accra awaits the invasion of the crusaders who have surrounded the gates. There, within the city walls, men and women of every age have gathered to hear the words of a mysterious man known only as the Copt. He has summoned the townspeople to address their fears with truth, hope and comfort. They begin with questions about defeat and struggle; they contemplate the virtues of loyalty and solitude; and they ultimately turn to questions of beauty, love, wisdom, and what the future holds. "What is success?" poses the Copt. "It is being able to go to bed each night with your soul at peace." Now, centuries later, the manuscript containing the Copt's extraordinary insights on courage, solitude, loyalty and loss has been unearthed from a cave in Cairo. 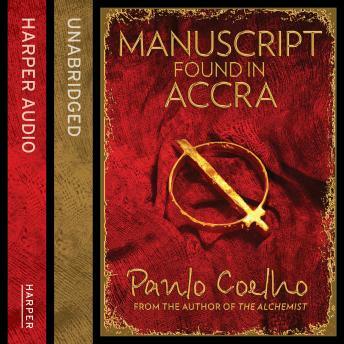 A Manuscript Found in Accra is a revelatory exploration of our most enduring and transcendental values, and a testimony to everyday wisdom.